These days, it seems every week, another prestigious panel of experts unveils a new report detailing the growing concerns of climate change. This time, the Obama administration itself has revealed the National Climate Assessment (NCA), a new report in line with the recent report by the Intergovernmental Panel on Climate Change, but solely focused on recent and future climate conditions in the United States. While the new report addresses the most up-to-date information and events impacting the U.S., it is in fact the third such document released by the U.S., as the second, which debuted in 2009, arrived to a significant amount of fanfare from environmental activists who believed it heralded a new age of Green legislation in Washington. When Republicans won back the House in 2010, however, Obama’s ability to pass climate change legislation cooled and a regression of Washington’s political fervor on the topic seemed inevitable. Then, Obama was reelected in 2013 following the crushing blow of superstorm Sandy, an event that seemed to convince even the conservative-minded that action must be taken to help curb the effects of climate change. Now, in tandem with the newest NCA, Obama has introduced a series of energy efficiency initiatives, and in June the Environmental Protection Agency is expected to enforce rules that will curb emissions from power plants, a major step toward decreasing the effects of greenhouse gases. These changes could not have come any sooner, according to the NCA. The report predicts even drier and hotter weather conditions for California, which experienced its worst drought on record in 2013, as well as Alaska, which has been shown to be heating up twice as fast as any other state over the last half a century. 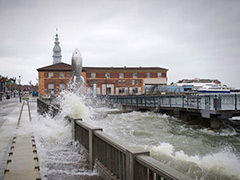 Rounding U.S. climate concerns predicted by the NCA are increased flood risks in coastal states and higher CO2 concentrations that will ultimately inhibit farming years down the line. It remains to be seen whether the proposed Green initiatives and changes to government policy will come to fruition. If past results are any indicator, real advancements may still be far off. For now, environmentalists simply have to hope that progressive reports like the NCA, and planned initiatives like the ones recently introduced by Obama, are more than just a bunch of hot air. Posted on May 14th under Pollution Reduction.